The 457 visa, served as a good route for Indians to work in Australia. It was abolished but statistics show that of the 90,000 holders 457 visas 22% went to Indians. Presently, Indians seeking permanent residency will find it tough to gain such status. In case they qualify after receiving education in Australian universities, they will need two years work experience in a special area to get a role. Furthermore, the meaning of Labor testing is that local workers will get a preference in a job vacancy. TSS visa replaces the Australia 457 visa and has two streams. The first is the short term stream which makes the hiring of temporary expat skilled workers possible especially in jobs appearing on the Short Term Skilled Occupation List. It will have two year duration. There is a provision to extend it to four years when the international trade obligations get a consideration. The second stream is the medium-stream where expatriates can be hired for jobs appearing on the Medium and Long-term Strategic Skills List and it will have the duration of four years. There is a bar on Short term TSS visa holders to give an application seeking permanent residence. Additionally, the medium/long term TSS visa holders can apply for Australia PR Status, but only after holding TSS visa for three years. Unless the job has a good demand, the options to gain permanent residency are few. Hiring the expatriates will be an expensive activity. Approved sponsoring companies must contribute towards a Skilling Australia Fund. Furthermore, the bill incorporating these features is presently under discussion in the Parliament. In case of passing the sponsoring company must definitely contribute to the Fund. The cost is likely to be $1,200 per employee nomination for every year of the visa term. The new rules are stricter, and aim at providing the way for top skilled, highly qualified professionals to migrate to Australia. There is a great degree of visa refusals in all sub-classes. 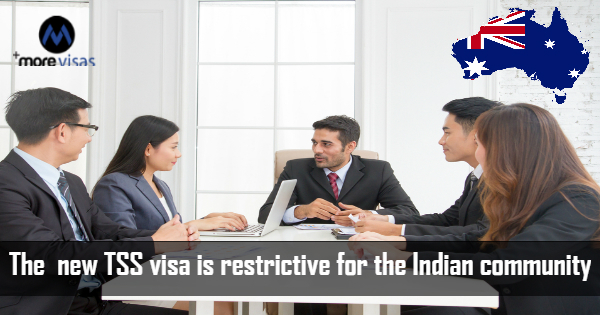 Officials are strict in approach and visa applications do not get an approval. Moreover there is no communication or warning in this regard.